Definition: Hemiparesis, or unilateral paresis, is a condition that is commonly caused by either stroke or cerebral palsy, although it can also be caused by multiple sclerosis, brain tumors, and other diseases of the nervous system or brain. 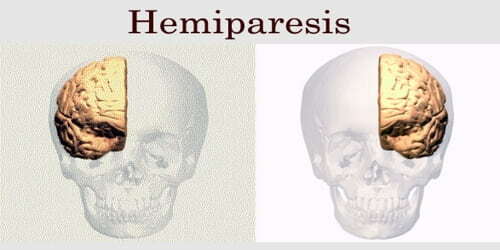 Hemiparesis (hemi- means “half”) is actually weakness on one side of the body. It can affect every area of life, from walking to eating to dressing. Recovering and living with one-sided weakness takes a multidisciplinary team, as well as a healthy dose of patience. 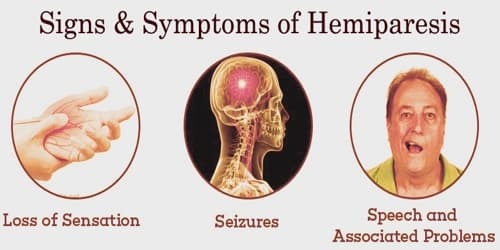 The word, ‘hemi,’ means, ‘one side, while, ‘paresis,’ means, ‘weakness.’ Approximately eighty-percent of people who experience a stroke also have some level of trouble moving one side of their body or have weakness on one side. One-sided weakness can affect people’s arms, hands, legs, and facial muscles. If people have the one-sided weakness they may have trouble performing everyday activities such as eating, dressing, and using the bathroom. Rehabilitation treatments, exercises at home, and assistive devices can help with their mobility and recovery. Hemiparesis is related to a condition called,’hemiplagia,’ involving paralysis of one side of a person’s body, instead of weakness. There are a number of reasons people develop hemiparesis, although the condition most commonly occurs as a secondary complication of another medical issue. The treatment options for hemiparesis differ depending on the reason why a person has developed the condition. Causes, Signs, and Symptoms of Hemiparesis: The most common cause of hemiparesis and hemiplegia is a stroke. Most strokes happen when the supply of fresh oxygen is cut off to a portion of the brain, causing brain cells to die. When areas of the brain that are responsible for movement and strength are damaged, it can lead to hemiparesis. Damage to the person’s spinal cord may include damage caused by trauma, such as injuries received through a fall, a car accident, or a wound received in a fight or combat. Conditions including multiple sclerosis, as well as some forms of cancer, may also cause lesions on a person’s spinal cord that interfere with the functioning of their nerves. Individuals who have uncontrolled diabetes, hypertension or those who smoke have a higher chance of developing a stroke. Weakness on one side of the face may occur and may be due to a viral infection, stroke or cancer. The muscle weakness that is characteristic of hemiparesis may be caused by lesions in a person’s spinal cord which damages their nerves and innervates their muscles, leading to weakness. Damage to the person’s brain can lead to muscle weakness as well. Stroke; however, is the most common reason people developing hemiparesis. At times, muscle weakness is one of the key symptoms of stroke, bringing people to the hospital in the first place. Hemiparesis is seen in 8 out of 10 stroke survivors. If people have it, they may have difficulty walking, standing, and maintaining their balance. People may also have numbness or tingling on their weaker side. Hemiparesis with origin in the lower section of the brain creates a condition known as ataxia, a loss of both gross and fine motor skills, often manifesting as staggering and stumbling. Pure Motor Hemiparesis, a form of hemiparesis characterized by sided weakness in the leg, arm, and face, is the most commonly diagnosed form of hemiparesis. Hemiparesis can sometimes be confused with hemiplegia. Both conditions can occur after a stroke. Hemiplegia, however, is paralysis on one side of the body, making it difficult to move the affected side at all. People may lose bladder control and have trouble speaking, swallowing, and even breathing. Hemiparesis, on the other hand, involves weakness rather than paralysis. Diagnosis and Treatment of Hemiparesis: Hemiplegia is identified by clinical examination by a health professional, such as a physiotherapist or doctor. Medical imaging studies can be used to isolate the location of the damage, and the patient will also typically be interviewed to collect a medical history for the purpose of identifying obvious risk factors. If a patient says that he or she has multiple sclerosis, for example, the doctor will likely attribute the hemiparesis to this condition and may conduct tests to confirm. Medication – Drugs can be used to treat issues related to the Upper Motor Neuron Syndrome. Drugs like Librium or Valium could be used as a relaxant. Drugs are also given to individuals who have recurrent seizures, which may be a separate but related problem after brain injury. Surgery may be used if the individual develops a secondary issue of contracture, from a severe imbalance of muscle activity. In such cases, the surgeon may cut the ligaments and relieve joint contractures. Preventions of Hemiparesis: In addition to rehabilitation treatment, exercise at home and assistive aids can help increase mobility. Repeated practice and regular activity will help increase control and flexibility and re-establish nerve circuitry. It is possible to recover from hemiparesis, but people may not regain their full, prestroke level of strength. 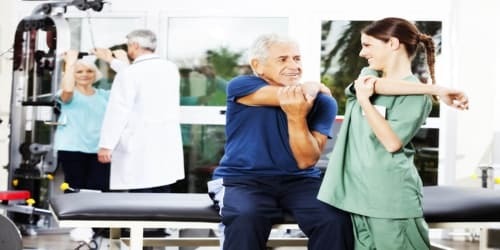 “Full recovery can take weeks, months, or even years, but regular rehabilitation exercises and therapy can help accelerate recovery,” says Dr. Cindy Cooke, president of the American Association of Nurse Practitioners. Sudden recovery from hemiplegia is very rare. Many of the individuals will have limited recovery, but the majority will improve from intensive, specialized rehabilitation. Potential to progress may differ in cerebral palsy, compared to adult acquired brain injury. It is vital to integrate the hemiplegic child into society and encourage them in their daily living activities. With time, some individuals may make remarkable progress.